Salmonella are common bacteria that cause food poisoning. The World Health Organisation (WHO) estimates 93.9 million cases of gastroenteritis due to Salmonella occur annually, and non-typhoidal salmonellosis (the disease caused by Salmonella infection) causes 155,000 deaths each year worldwide. Click here to view a great introduction to Salmonella by the Food Standards Agency (FSA). Salmonella are found in raw meats, raw poultry, raw soiled vegetables, unpasteurised milk and in the guts of birds and mammals (including people). Although symptoms from Salmonella infection are generally short-lived, longer-term health implications, such as reactive arthritis and meningitis, can develop. Salmonella prevalence in the UK has fluctuated significantly over the last 30 years. The British Lion Code of Practice was introduced in 1998 and ensures safe eggs from the farm through production and to the retailer. It is the UK’s modest example of a food safety success story, with 90% of all eggs in the UK produced under the scheme (EggInfo, 2017). The success of the Code of Practice has resulted in eradication of Salmonella in British Lion eggs, and subsequent changes to the FSA’s official advice to the public regarding egg safety, confirming that “British Lion eggs are safe enough for even vulnerable groups to consume when raw or runny”. Of course it is very important that this change of advice does not apply to foreign eggs, or eggs not in the scheme. Despite this, cases of Salmonella infection still occur across the UK. In 2018, Public Health England (PHE) saw a rise in cases of patients infected with Salmonella typhimurium linked to lamb and mutton. A total of 283 cases were reported up until October 2018. It is vital for us to understand how bacteria such as Salmonella spread and how to avoid infection within the home and workplace. Prevention requires control measures at all stages of the food chain, from agricultural production, to processing, manufacturing and preparation of foods in both commercial establishments and at home (WHO, 2018). Clean and disinfect work-surfaces and utensils after preparing raw meat, poultry and soiled vegetables. If you have a dishwasher, this is the best place for utensils, and antibacterial cleanser and paper towel creates the lowest risk of spreading bacteria around when cleaning contaminated worksurfaces (don’t turn your cloth into a germ motorway)! Food should be cooked or reheated until it 75°C in the middle – use a clean food thermometer to check (disinfect in a cup of just boiled water). These thermometers can be purchased cheaply from supermarkets and kitchen shops or here. 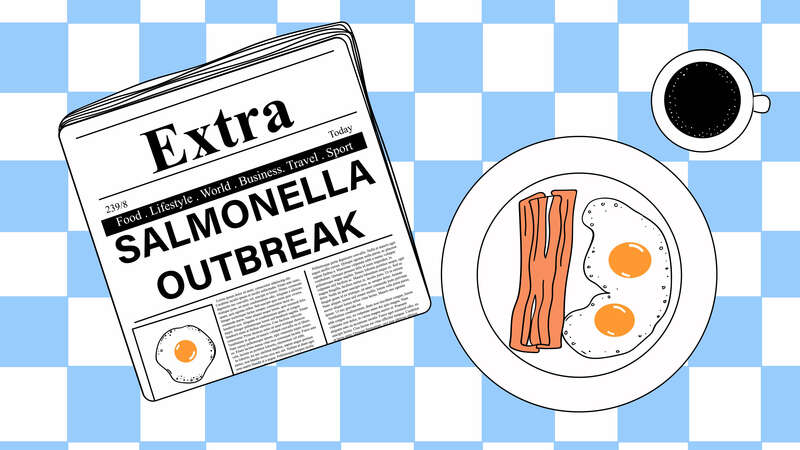 For more information on Salmonella food poisoning and prevention strategies, I have worked with the Royal Society for Public Health to produce an e-learning programme, Salmonella: facts and prevention strategies, which launched in March 2019. Users are awarded 3 CPD points upon completion.